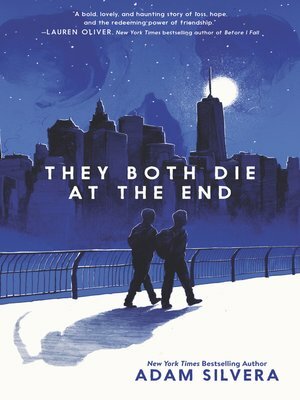 Adam Silvera reminds us that there's no life without death and no love without loss in this devastating yet uplifting story about two people whose lives change over the course of one unforgettable day. On September 5, a little after midnight, Death-Cast calls Mateo Torrez and Rufus Emeterio to give them some bad news: They're going to die today. Mateo and Rufus are total strangers, but, for different reasons, they're both looking to make a new friend on their End Day. The good news: There's an app for that. It's called the Last Friend, and through it, Rufus and Mateo are about to meet up for one last great adventure—to live a lifetime in a single day. In the tradition of Before I Fall and If I Stay, They Both Die at the End is a tour de force from acclaimed author Adam Silvera, whose debut, More Happy Than Not, the New York Times called "profound."